LAKEFRONT on BEAVER LAKE in Wallenpaupack Lake Estates. 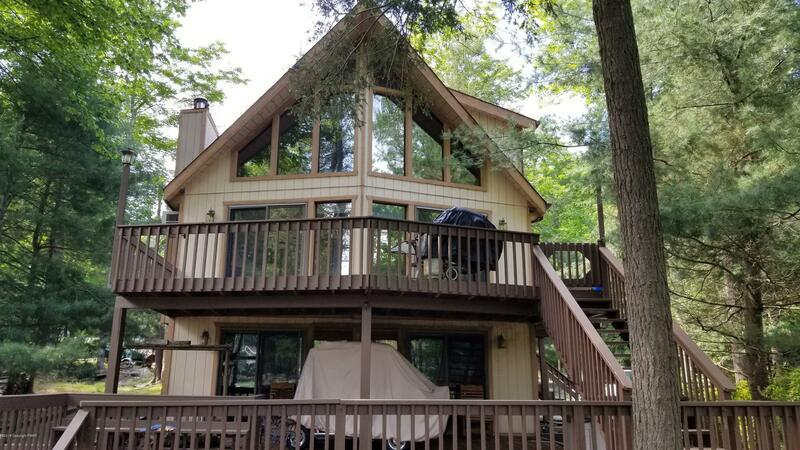 This beautiful chalet offers 3 bedrooms, 2 1/2 baths, loft, hardwood floors, living room with fireplace, family room with woodstove, cathedral ceilings, skylights, open floor plan, decks, patio, shed and a one car garage. All situated on a level landscaped parcel with your own lakefront dock. Great location with Beaver Lake Pool just a short distance away. Community offers 2 outdoor pools, 1 indoor pool, fitness center, beaches, tennis courts, clubhouses, hiking trails, community dock area on power boating Lake Wallenpaupack and more! This lake home comes furnished! Pocono Mountains Association of REALTORS. This listing data is current as of 04-25-2019 14:42 UTC. This property was still available as of 04-25-2019 14:42 UTC.